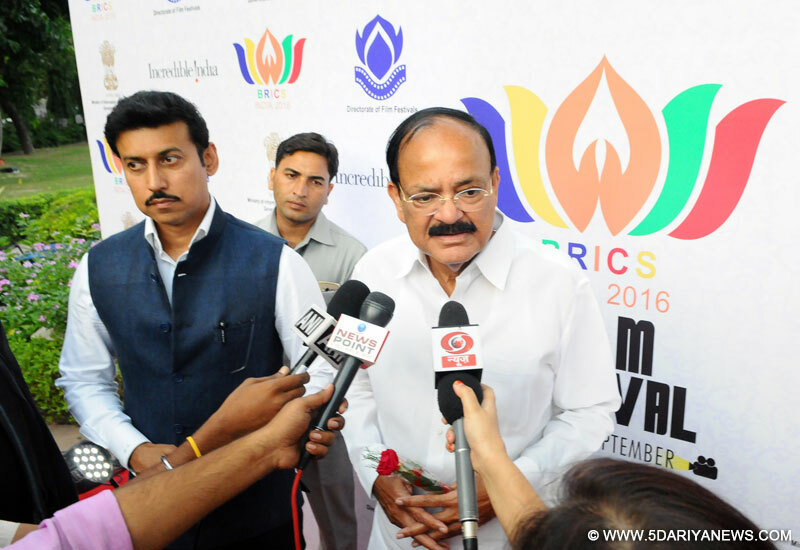 M. Venkaiah Naidu, Minister for Information & Broadcasting has said that the New age cinema from the BRICS nations speak to a wider audience with socially relevant themes, and are not afraid of communicate in the way they desire. This inspires young film makers to make films that are not only entertaining but also enlightening. As a powerful medium it sends across the right message that can counter the negativity emerging from acts of Terrorism worldwide. Films have sparked national consciousness and helped in channelizing the energies of youth in social reconstruction and nation building. The Minister stated this at the closing ceremony of the First BRICS Film Festival. Col. Rajyavardhan Singh Rathore, Minister of State, Ministry of I&B.Elaborating further Shri Naidu said, that a specially curated BRICS section would form part of the India International Film Festival from this year onwards which would become a regular feature in the future editions of IFFI. To promote India as filming destination the Minister stated that the Government was actively considering signing co-production agreements with Russia and South Africa taking the process forward of having signed similar agreements with Brazil and China.The Minister also proposed that setting up institutional mechanisms for regular collaboration between film archives of the member countries would also be beneficial as it would ensure exchange of information on preservation of our filmic heritage. He also mentioned that the BRICS countries can explore the possibility of having a formal mechanism for student exchange programmes among the leading film institutes of our countries. Regarding the institutionalized mechanism of promoting of India as a soft power, Shri Naidu said the diverse topography of India offers a variety of locales for shooting of films round the year. In addition to this, India is home to one of the most vibrant and highly skilled film industry. The Government has taken several steps to create a conducive environment for shooting films in India by international filmmakers. One such step is setting up of Film Facilitation Office under National Film Development Corporation. BRICS film directors could take this opportunity to explore possibilities on shooting their films in India.The Kannada Movie “Thithi” from India was awarded the Best Film from the Jury members, while the Special Jury was awarded for the movie “Between Valleys” from Brazil. Mr. Huo Jianqi from China was awarded the Best Director award for the Movie, “Xuan Chang” . Mr. Thabo Rametsi from South Africa was awarded the Best Actor (Male) award for his acting in the movie “Kalushi (The story of Solomon Mahlangu)” and Ms. Yulia Peresild from Russia was awarded the Best Actor (Female) award for her role in the movie “Battle for Sevastopol”. The jury also recommended Special Mention awards to the Movie “Songs of the Phoenix” from China and the movie “14+” from Russia. The BRICS Film Festival was held from September 2nd to September 6th, 2016. In the course of 5 days of the event, 20 movies was screened in the competition section, 4 from each of the countries. The opening film at the Film Festival saw the World Premiere of the Malayalam movie, Veeram directed by Shri Jayaraj Rajasekharan Nair and starring Kunal Kapoor. The Closing film would be the Chinese movie, Skiptrace, starring Jackie Chan directed by Renny Harlin. The movie is an action-comedy, which revolves around a Chinese detective who teams up with an American Gambler to catch a Chinese Criminal.The film festival showcased an amalgamation of culture, films, song & dance and food of the 5 member countries, Brazil, Russia, India, China and South Africa. Exclusive cuisines from all the BRICS nations was also available at the Food Court, arranged in the festival venue. A Craft Fair was also organized at the Siri Fort auditorium complex with all member countries putting up stalls with souvenirs and other properties for sale.Beyond films, the Festival also showcased on stage spectacular performances by the Chengdu Performing Arts Theatre (China), Theatre Leningrad Centre Dreams (Russia) and MBZ Music Production (South Africa).The closing ceremony also saw the release of the first BRICS Film Festival Scroll, which was presented to representatives from China. It was announced that China would host the next version of the BRICS Film Festival in Chengdu.